Styled with westley short . Yes, those sleeves. 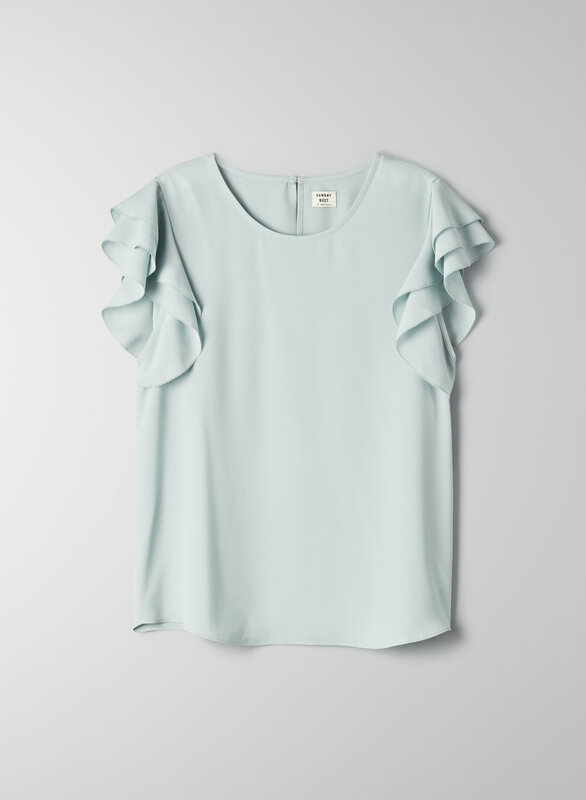 This is a crewneck blouse with picot-trimmed ruffles at the shoulder and a boxy body. It's made with a fluid, silk-like fabric that's wrinkle-resistant and easy to care for. I love this top so much I got it in two colours! I can count on one hand how many times I have had to size up in Aritzia because I am a true XXS and this top is one of them. I would recommend sizing up. I always wear a size XXS in Aritzia. This top fits quite small in this size - it fits me, but it is more of a tighter fit rather than the loose draped fit pictured. Also, I am only 5'0" and this fits me like a crop top. It is too short to be tucked into my dress pants and if I were to raise my arms up it would expose my stomach. That said, it would be very pretty if not so short. Unfortunately, it is a little small for me. I would need the next size up.